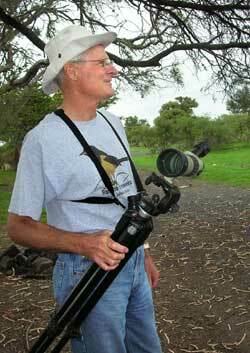 John Keeling of the Lake Chapala Birding Club making his monthly circuit of the lake. 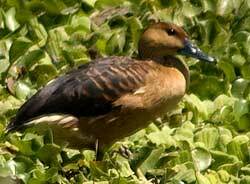 Fulvous Whistling Duck (Dendrocygna bicolor). This is one of the most widespread of all waterfowl, naturally occurring on four continents but nevertheless rare and considered exotic in some places. 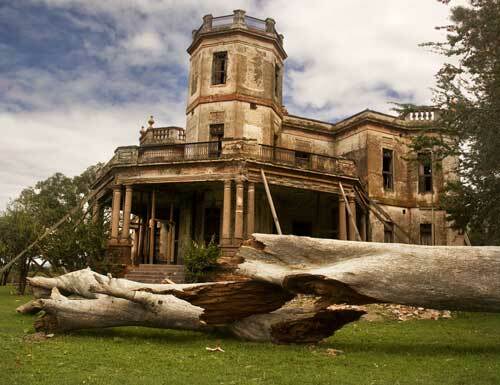 Hacienda La Maltaraña—also called La Bella Cristina—is said to have been built by Manuel Cuesta Gallardo, one of the richest men of his day and constructor of the dike which shortened Lake Chapala to its present length. 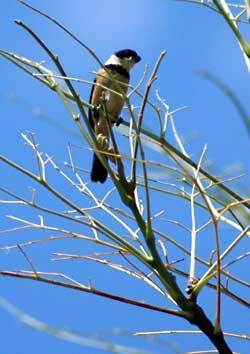 A White-Collared Seedeater (Sporophila torqueola) seen off the dike on the way to La Maltaraña. View from the porche of La Maltaraña. 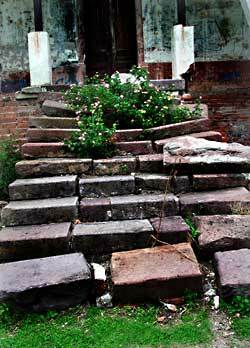 Remains of a once-beautiful staircase. 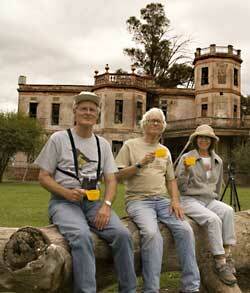 John Keeling (left), takes a coffee break with John and Susy Pint on the spacious grounds of La Maltaraña, a century-old hacienda built along a historic dike at the eastern end of Lake Chapala. No, they are not sitting on the log with the bee hive inside! 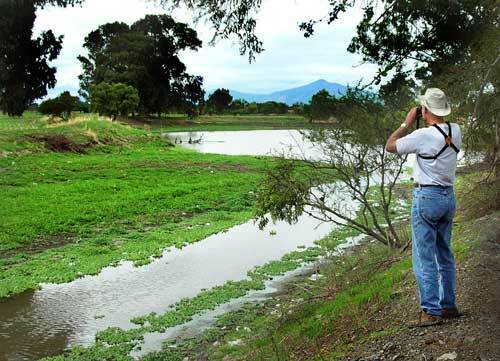 John Keeling is the head of the Lake Chapala Birding Club in western Mexico and one of his duties as such is to make a complete circuit of the lake once a month, noting the different species of birds he sees along the way. When he also mentioned that the road to La Maltaraña runs along the top of a historically important dike which had changed the size and shape of Lake Chapala 100 years ago, I was hooked. Even though John K. had sent us detailed instructions for reaching La Maltaraña on our own, I asked him if Susy (my wife) and I might tag along on his next visit to the eastern end of the lake, sure that we were bound to learn a lot about the local birds in the company of Chapala’s number one birder. So it was we met at Los Burritos de Moyahua restaurant early one morning and, after heading east on highway 35 for about an hour, reached the town of Jamay. “By the way,” said John, “Jamay has a large and impressive monument in its plaza, said to have been built entirely by local people over 100 years ago.” This, I found out later, is a 20-meter-high lavishly decorated column in honor of Pope Pius IX, constructed in 1876. As we drove along the raised road, John told us that the dike, which is 24.14 kilometers long altogether, was built between 1906 and 1909 by Manuel Cuesta Gallardo, one of the richest men of his day. 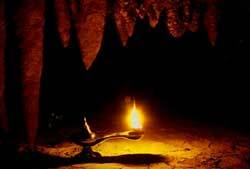 He saw that the eastern end of the lake was shallow, marshy, and rich in silt deposited by the Lerma River. “So,” said John, “Manuel persuaded President Porfirio Díaz to grant him a license to drain one third of Lake Chapala and sell the land for agriculture, just like other smart developers were doing in California. 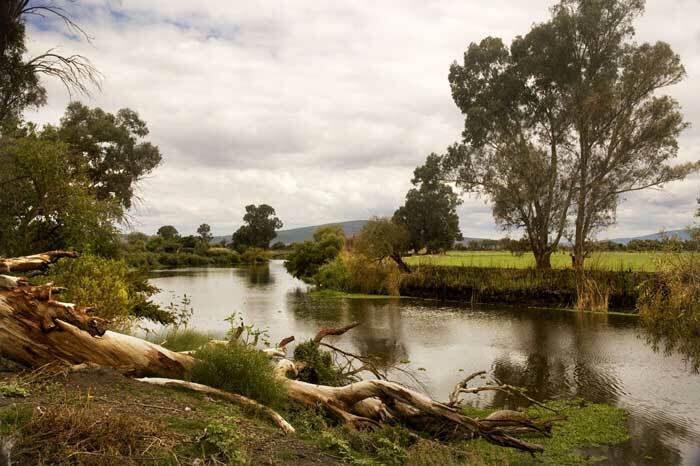 Manuel built his dike across the lake from Jamay on the north shore to La Palma on the south shore, and also built raised dikes along each side of the Lerma River and its tributary the Duero River. Water was pumped out of the marshy areas and the land was sold. Back in those days Lake Chapala may have stretched as far southeast as Zamora. I suspect it would take only 20 minutes to cover the eight-kilometer stretch between Jamay and La Maltaraña, but bird watching was the order of the day, meaning that we rolled along rather slowly, stopped rather frequently (and often suddenly) and usually jumped outside enthusiastically for a better look with binoculars or to photograph the picturesque marsh below us. In this fashion, we proceeded to La Maltaraña, which—seen from a distance—is still a truly beautiful building, said to be of either a French or Italian style, with 365 doors and windows. The land is cleared all around it, affording a wonderful view and, in the Mexican tradition, there’s no fence to keep you away from the lovely old hacienda, which is also known as La Bella Cristina, supposedly in honor of Manuel Cuesta’s niece. As you draw near, you see that it’s only standing thanks to dozens of wooden poles propping it up from both the outside and inside. Someone obviously could not bear to see the old house crumble to the ground and had gone to a lot of trouble to keep it looking beautiful. 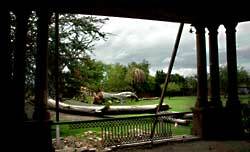 We were surprised that same someone had not erected a sign narrating the history of the place and we were glad we had John Keeling at our side as we sat down on a big fallen tree trunk for a cup of coffee. Later we learned that President Porfirio Díaz used to spend Easter on Lake Chapala, after taking the train from Mexico City, sometimes staying at the Atequiza hacienda, but also visiting La Maltaraña… ironically, not to watch birds, but to hunt and kill them. Naturally, as we listened to our bird expert talk about the hacienda, what should zoom across the sky above us than several green parrots, which appear to have a big nest high in a tree on the property. For once, John was stumped as to exactly what kind of parrot we had seen, obviously an introduced species. So, if you haven’t discovered motivation enough to visit Hacienda La Maltaraña and the dikes as historical attractions, you can always go there to try to identify the mystery parrots and “outbird” John Keeling and the Lake Chapala Birding Club. By the way, we heard the buzzing of bees inside one of the fallen logs near the house. 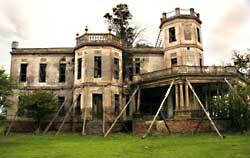 Better to stay away from them, but there’s plenty of room far away to set up a table and chairs and have a pleasant picnic under the shadow of the picturesque old mansion. 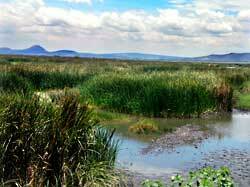 From Guadalajara or Chapala, take the Airport Road to highway 35 heading east toward La Barca. Pass Ocotlán and when you get to the eastern end of Jamay, just after passing a Pemex station, look for a large, brightly colored yellow and blue building on your left. Turn right here (N20 17.667 W102 42.128), set your odometer to zero and go south two blocks. Then dog-leg to the left for 16 meters in order to keep following the same road south. Now you are on the dike, which starts out paved, but later becomes gravel. Follow the dike south for 6.9 kilometers. At this point you will note that the road is overhung by trees and curves left. Instead, you must turn right (N20 14.220 W102 41.208), descending steeply from the dike. After 170 meters you’ll cross a bridge over an irrigation canal. Now turn left (N20 14.203 W102 41.300) to continue heading south. Take the very first road to the left (about 70 meters after the bridge) to drive straight up to Hacienda La Maltaraña (N20 13.861 W102 41.145), a grand total of 7.8 kilometers from the highway at Jamay. (My thanks to John Keeling for help with these directions). If you would like coordinates for GPS, see La Maltaraña at www.ranchopint.com. The beautiful Lerma River runs right next to La Maltaraña and then empties into Lake Chapala, depositing fertile soil along its banks.